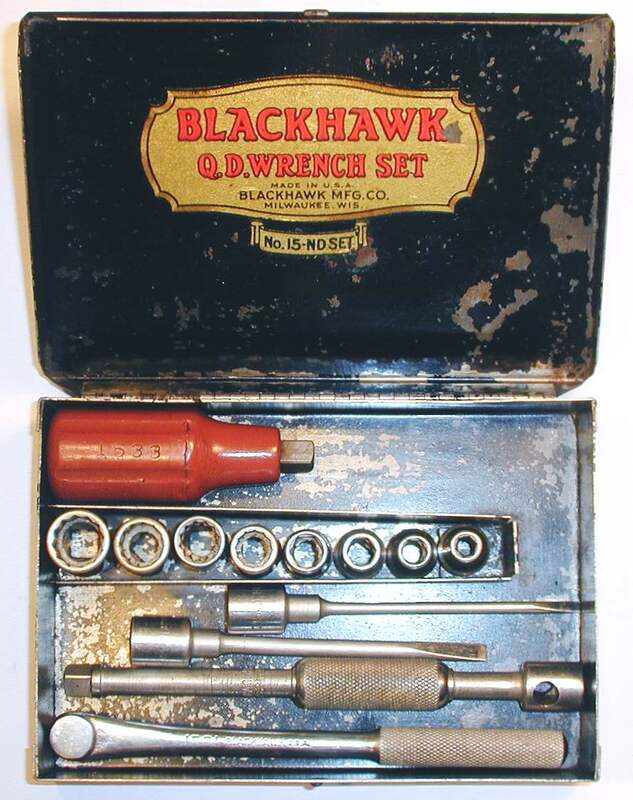 By 1937 Blackhawk's line of Lock-On tools had been fully developed, with a wide range of tools and sockets available in 1/2, 3/4, and 1 inch drive sizes. Blackhawk offered a surprise at the smaller end of the drive sizes: instead of 3/8-drive, the company developed a line of 7/16-drive Lock-On tools to span the socket sizes previously serviced by 3/8-drive. In this section we'll explore the tools in the mature Lock-On line. With the maturing of the Lock-On line came a new production protocol: the use of a single-digit marking that functioned as a date code. This section will explore the discovery (and limitations) of this undocumented code. 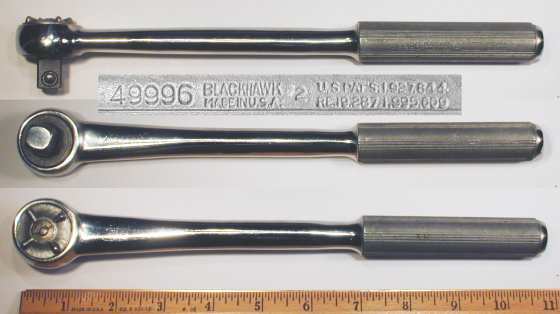 Although Blackhawk tools in general are not marked with a manufacturing date code, certain of the older tools have been observed with a digit that appears to be a date code. If present, the code will be a single 0-9 digit, sometimes with a leading hyphen as in "-6". Determining the meaning (if any) of these codes has been a long standing puzzle. The hyphen prefix, if present, is not known to be significant, but might represent a half-year marker. The following list provides the evidence gathered for the interpretation of the date codes. Blackhawk made a number of changes to the style of tool handles over the years. One style, called "Gripline" by the catalogs, had raised ribs along the axis of the handle; this style was definitely in use by 1941 (or earlier), based on illustrations in 1941 and 1942 catalogs. A later 1947 catalog shows tool handles with several turned grooves for 1/2-drive tools, and a streamlined "bullet" handle for the 7/16-drive tools. 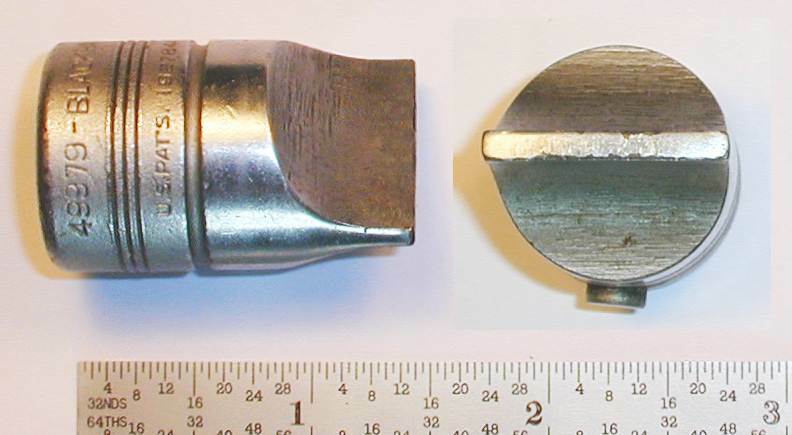 Two later figures show a Drain-Plug Wrench and a Free-Wheeling Ratchet with the Gripline handle style, and their codes of "-1" and "-2" are consistent with the date code interpretation. 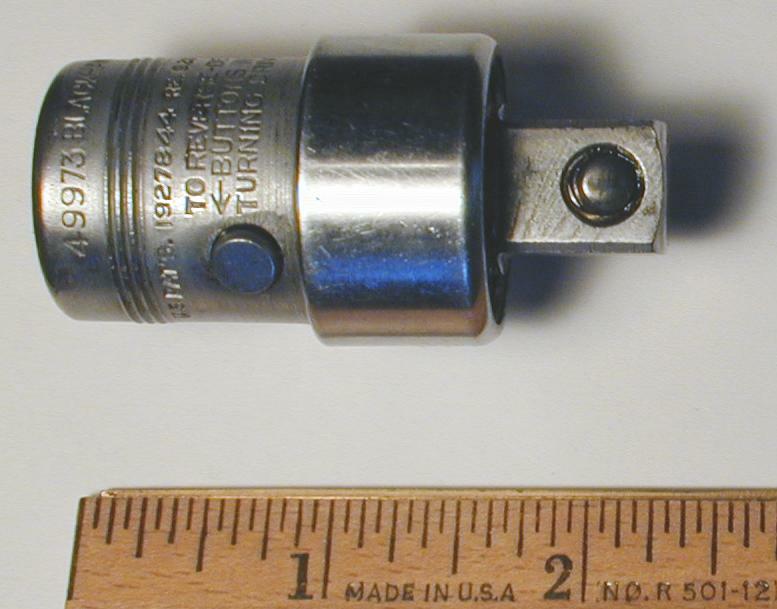 Another figure shows a 49983 Swivel-Grip Extension with the same handle style, and its date code of "-3" is consistent with 1943 manufacture. A later figure for a 7/16-drive Model 39999 Speeder shows a bullet-style end piece, and its date code of "7" is consistent with manufacture in 1947. 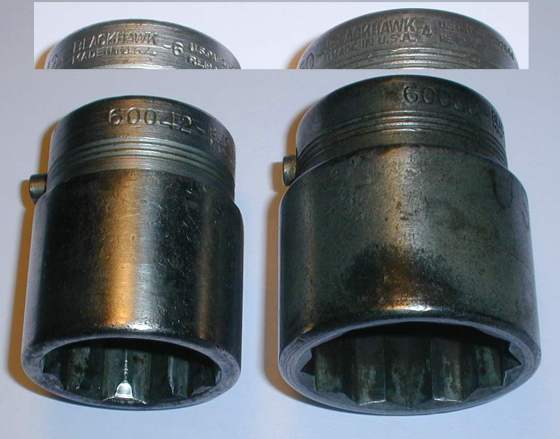 The 1930 catalog shows Lock-On sockets made with knurled bands, but by 1941 (or earlier) the 401xx series sockets were made with three grooves around the base. The three-groove style continues for the 1947 and 1953 catalogs that were checked. All of the known examples for digit codes on sockets are for the three-groove style, suggesting that the date codes were first applied after the change to this style. Lock-On sockets made prior to the three-groove style had scalloped indentations in the drive ends, to assist with depressing the lock pin; see for example the Blackhawk 66xx sockets. 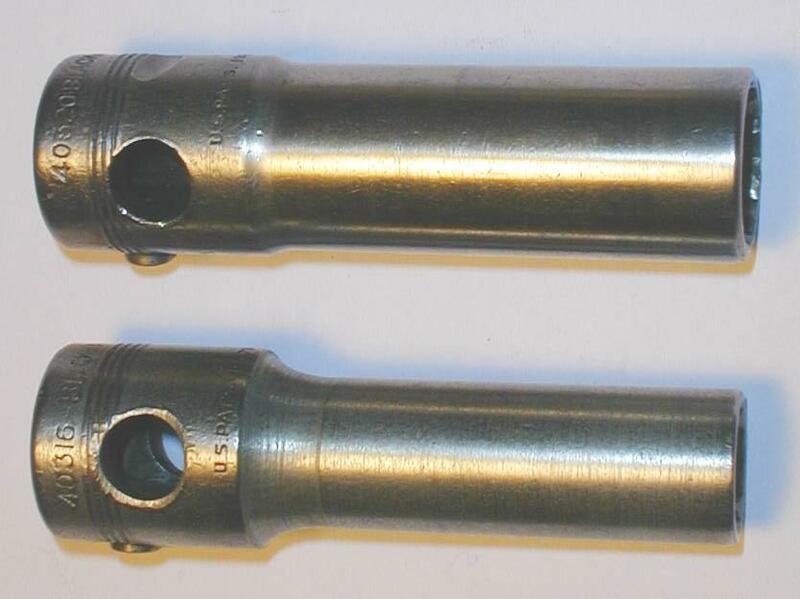 These indentations continued into the early three-groove sockets, as can be seen in these Blackhawk 401xx sockets, but are not found for 1941 or later. 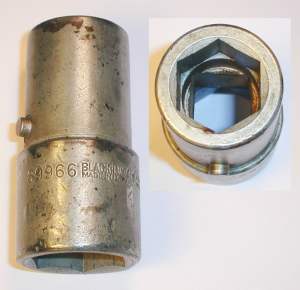 One example is available of a Blackhawk 40134 socket with both the drive end indentations and with a date code marking of "9". Figures later in this article will show examples of Lock-On sockets with plain steel or cadmium plated finishes, and these sockets are marked with a digit code "4", consistent with a manufacturing date of 1944. Comparisons of chrome and cadmium finishes can be seen in the Blackhawk 40119, Blackhawk 60042, and Blackhawk 60050 sockets. Reasoning from the above evidence, the interpretation of the digit codes as the year in 1938-1947 is consistent with the known examples. But what about the years after 1947? Recently some examples have been found of tools that bear a date code, but that can be reasonably dated to the early 1950s. This implies that Blackhawk simply kept marking its tools with the year's digit, with the relevant decade left to inference. This would not be a problem for tools with handles, as these were known to have changed in 1947, but for sockets and some other tools the decade may be ambiguous. For example, the three-groove socket design appears in catalogs at least until 1953, so some additional information would be needed to distinguish a 1951 tool from the 1941 version. This ambiguity is still being investigated, and hopefully can be resolved to a satisfactory degree. We can offer one example where additional catalog information proved sufficient to distinguish otherwise similar tools, as discussed with the 1942 ratchet adapter and 1952 ratchet adapter. Hopefully this date code interpretation will prove useful in its current form, but of course it's possible that later examples will require further revisions. The successors to the earlier Lock-On tools in the 1/2-drive size were the 40xxx series sockets and 499xx series drive tools. The sockets shown up to this point have included a cross-hatched or knurled band, a stylistic hold-over from the days when a band of coarse knurling served as a hand grip. In 1937 Blackhawk decided it was time for a makeover in socket style, and Sigmund Mandl developed a new socket design with three grooves around the base. Mandl filed a design patent for this three-groove socket style and received patent #D108,143 in 1938. The three-groove design went into production in late 1937 or early 1938, and Blackhawk used this style for all of their sockets, except for the 1 inch drive size. Around this same time Mandl also filed a design patent for a tool handle with raised ribs, apparently as a "coordinating style" for the sockets, and examples of this "Gripline" handle style will be seen later. Fig. 194. Blackhawk 401xx 1/2-Drive Lock-On Sockets, with Inset for Drive Ends, ca. 1937-1938. Fig. 194 shows a group of three early Blackhawk 401xx series 1/2-drive 12-point Lock-On sockets, the successors to the 66xx models. The model numbers and sizes are, from the left, 40112 (3/8), 40136 (1-1/8), and 4140 (1-1/4). All are marked "Made in U.S.A." and "U.S. Pats. 1,927,844 RE19,287", except that that rightmost socket is missing the patent markings. 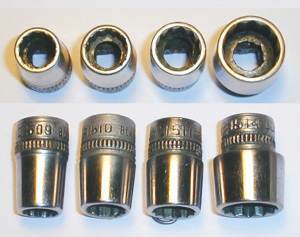 These sockets have several features that collectively suggest that these are very early examples of the 401xx socket series. The first is the presence of the scalloped indentations in the drive ends, as shown in the inset. This feature was first seen in the 66xx series sockets, but is absent from most examples of the 401xx series. Most 401xx sockets show only a small chamfer at the drive end, as this was found to be sufficient for operation once the improved Lock-On slanted drive studs were in wide use. Another detail is the large font size for the stamped model numbers; compare these to the other figures for 401xx series sockets. The rightmost socket also shows yet another marking oddity: the model number has been stamped incorrectly, as "4140" instead of "40140". This suggests that perhaps the marking machinery was still being set up for the 401xx models, or possibly they were being stamped by hand. The last detail to note is that these sockets have no date code marked, a notable absence since most sockets of this style do show a date code. Fig. 195. 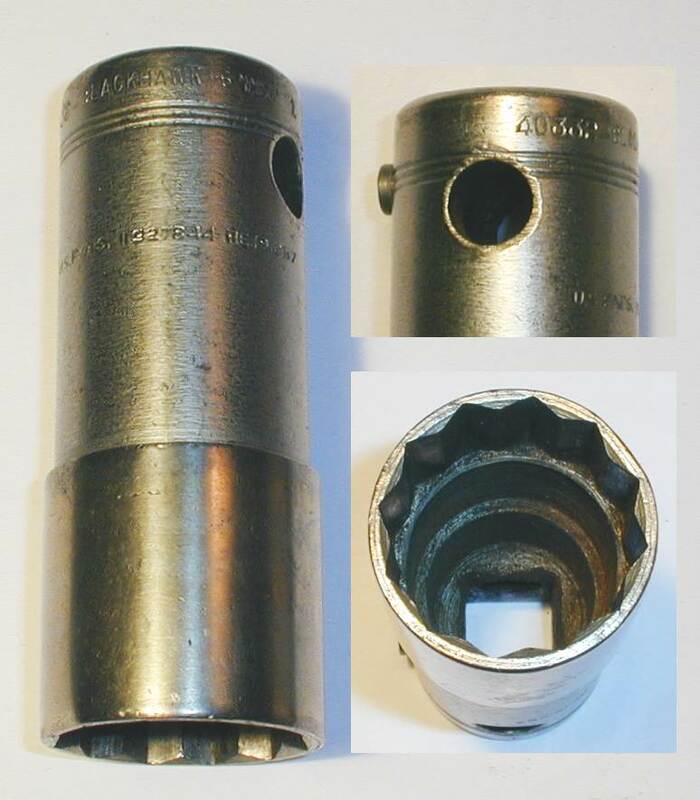 Blackhawk 40134 1/2-Drive Lock-On Socket, with Inset for Drive End, 1939. In Fig. 195 we see a single 1/2-drive Blackhawk model 40134 1-1/16 Lock-On socket, marked "Made in U.S.A." and "U.S. Pats. 1927844 RE19287". The inset shows the drive end indentations, indicating that this is another fairly early example of the 401xx series. However, unlike the previous examples, this one is marked with a date code of "9", visible in the photograph to the right of "Blackhawk". The presence of both the indentations and date code is significant, as it means that the manufacturing date would have been 1939, and the date code system must have started in the late 1930s. This socket was very helpful in refining the interpretation of the date codes. Fig. 196. 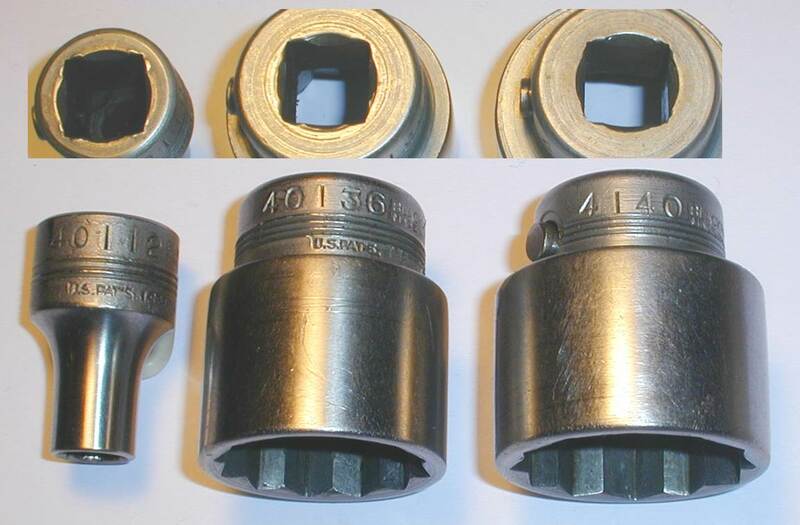 Blackhawk 1/2-Drive 401xx Lock-On Sockets, from Left: 8124, 40119, 40120, 40132. Fig. 196 shows a group of later Lock-On sockets with the older model 8124 socket included for comparison. All are 1/2-drive with model numbers (from the left) 8124 (3/4, 8pt), 40119 (19/32, 12pt), 40120 (5/8, 12pt), and 40132 (1", 12pt). All are marked "U.S. Pats. RE19287 1,927,844". Note that the middle two sockets are finished with a thin (and worn) cadmium plating, and these two sockets both have a date code of "4". The righthand socket is chrome plated and has a date code of "1". (The socket on the left is also chrome plated, but is an older model with no date code.) These details contributed to understanding the date code system explained earlier. Fig. 197. Blackhawk 1/2-Drive Deep Lock-On Sockets, from Bottom: 40316, 40320. Fig. 197 shows two 1/2-drive deep 12-point Lock-On sockets, both marked "U.S. Pats. 1927844 RE19287". The models and sizes are (from the bottom) 40316 (1/2) and 40320 (5/8). The bottom socket is marked with a date code of "4" and has a cadmium finish, which is consistent with manufacture in 1944. The top socket is marked with a date code of "1" and is finished in polished chrome, consistent with manufacture in 1941. The sockets have a hole for a cross-bar, a common feature for deep sockets at the time. Fig. 198. Blackhawk 40332 1/2-Drive 1 Inch Socket, with Insets for Broaching and Marking Detail, 1946. Fig. 198 shows a another example of the 403xx series, a 1/2-drive Blackhawk 40332 1 inch deep socket. The base is stamped "Made in U.S.A." with a "-6" date code, and a "U.S. Pat's. 1927844 RE.19,287" patent notice appears part way up the socket wall. The lower inset shows the broaching and construction details. Note that the inside has a stepped diameter to provide clearance and reduce the weight. The next several figures will show examples of the Blackhawk 49983 extension, a popular tool with a rotating hand grip. We're fortunate to have acquired examples spanning a range of date codes and handle styles. Fig. 199. Blackhawk 49983 1/2-Drive 6 Inch Extension with Rotating Grip, ca. 1937-1938. Fig. 199 shows an early Blackhawk model 49983 1/2-drive 6 inch extension with a rotating grip, marked "Made in U.S.A." with the "U.S. Pats. 1,927,844 RE19,287" patent notice. The overall length is 6.0 inches, and the finish is polished chrome. The cross-bar hole has a detent ball to help secure the bar when in use, a convenience feature missing from modern tools. The rotating hand grip on this tool has distinctive raised ribs along the axis, a style called "Gripline" in the Blackhawk catalogs. The Gripline style was based on the design patent #D108,159, filed by Sigmund Mandl in 1937 and issued in 1938. Blackhawk used the Gripline style from about 1938 through 1946, and we'll see numerous other examples of these handles in the figures that follow. No date code was marked on this tool, but several details will help to estimate the manufacturing date. The Gripline handle indicates production in 1938 (or late 1937) or later, based on the filing of the design patent. In addition, the drive end of the extension has scalloped indentations, a feature seen in the earlier 401xx series sockets. Finally, the absence of a date code itself may indicate that the tool was made before the start of the coding system. From these considerations, this extension was likely made in late 1937 or early 1938. Fig. 200. Blackhawk 49983 1/2-Drive 6 Inch Extension with Rotating Grip, 1943. Fig. 200 shows a somewhat later example of the model 49983 extension, marked "Made in U.S.A." with a "-3" date code, and with the usual "U.S. Pats. RE19287 1,927,844" patent notice. The rotating grip is in the Gripline style we saw in the previous example. The Gripline handle and "-3" date code on the tool indicate a manufacturing date of 1943, which is consistent with the wartime manufacturing date suggested by the cadmium finish. Fig. 201. Blackhawk 49983 1/2-Drive 6 Inch Extension with Rotating Grip, with Insets for Drive End and Marking Detail, 1947. The overall length is 5.5 inches, somewhat shorter than the earlier models above. The finish is chrome plating with losses due to wear. The "7" date code with the updated handle style indicates a manufacturing date of 1947. The left inset shows the cross-bar hole and detent ball in the drive end, making this tool highly functional as a T-handle. Fig. 202. Blackhawk 49987 1/2-Drive 10 Inch Rotating-Grip Extension, 1941. Fig. 202 shows a longer model 49987 1/2-drive swivel grip extension, marked "Made in U.S.A." and "U.S. Pats. 1927844 RE19287". The overall length is 10.0 inches, and the finish is polished chrome. The rotating grip is the Gripline style seen in some of the previous examples. The date code is marked "-1", which together with the Gripline style indicates a manufacturing date of 1941. Fig. 203. Blackhawk 49990 1/2-Drive 10 Inch Extension, with Insets for Construction and Marking Detail, 1947. Fig. 203 shows a later 1/2-drive Blackhawk 49990 10 inch plain extension, marked "Made in U.S.A." with a "-7" date code for 1947, and with a "U.S. Pats. 1927844 RE19287" patent notice. The overall length is 9.7 inches, and the finish is polished chrome. The right inset shows the drive end with its cross-bar hole and detent ball for a 9/16 diameter bar, allowing operation as a Tee-handle. Fig. 204. Blackhawk 49978 1/2-Drive Universal, 1941. Fig. 204 shows a Blackhawk model 49978 universal, marked "Made in U.S.A." with "U.S. Pats. 1,927,844 RE19287". The overall length is 2.6 inches. The date code is marked "1" to indicate production in 1941. An additional code "FR" follows the date code digit, but the meaning of this marking is currently unknown. The slanted locking pin of patent #1,927,844 can be seen clearly in this figure. Fig. 205. Blackhawk 49985 1/2-Drive 15 Inch Flex Handle, with Inset for Marking Detail, 1941. Fig. 205 shows a 1/2-drive Blackhawk 49985 15 inch flex-head handle, stamped "Made in U.S.A." with "U.S. Pats. RE19287 1927844" and a "1" date code. The overall length is 15.6 inches. The handle is the "Gripline" style with parallel ribs, and has a cross-bar hole for use as a Tee-handle. In addition, the handle end has been drilled out for an extension bar. The "1" date code together with the "Gripline" handle style indicates production in 1941. Fig. 206. Blackhawk 49994 1/2-Drive 15 Inch Speeder, with Inset for Marking Detail, 1941. Fig. 206 shows a Blackhawk model 49994 1/2-drive speeder, marked "Made in U.S.A." with a "U.S. Pats. RE19,287 1,927,844" patent notice. The wide circular end-piece is also marked "U.S. Pats. 1,764,690" for the patent on the end-piece construction. The speeder is marked with a date code of "-1", indicating production in 1941 or 1951. Fig. 207. Blackhawk 49977 1/2-Drive Ratchet, with Insets for Side View and Marking Detail. Fig. 207 shows a Blackhawk 49977 1/2-drive ratchet with a stamped steel body, marked "Made in U.S.A." with "U.S. Pats. 1927844 RE.19287" on the reverse. The ratchet is marked with a "9" date code, which could indicate production in either 1939 or 1949. The reverse side has an "FR" code of currently unknown meaning. The 49977 ratchet is the successor to the Model 9811 and Q.D. Model 911X ratchets, and is in fact nearly identical to the later versions of the older models. The ratchet mechanism uses an 18-tooth main gear and is fitted with a Lock-On drive stud. Fig. 208. Blackhawk 49996 1/2-Drive Ratchet, with Insets for Reverse, Side View, amd Marking Detail, 1942. Fig. 208 shows a 1/2-drive Blackhawk 49996 ratchet, stamped with "Blackhawk" and "Made in U.S.A." on the handle, with a "2" date code and a "U.S. Pats. 1927844 RE19287 1995009" patent notice. The overall length is 10.7 inches, and the finish is polished chrome. The handle design is the "Gripline" style previously seen on several extensions, a style known to have been in use by 1938. The "2" date code and "Gripline" handle style indicate production in 1942. One notable detail for this ratchet is the very compact head, measured at only 1.4 inches across. The compact size is made possible by the ratchet mechanism described by patent #1,995,009, filed by E.M. Pfauser and S. Mandl in 1931 and issued in 1935. This patent was also used for Blackhawk's ratchet adapters, such as the Blackhawk 49973 Ratchet Adapter shown in a later figure. One of the Blackhawk's notable innovations in drive tools was their development of practical and effective gearless ratchets, which they termed "Free-Wheeling" ratchets. The gearless designs were developed and patented beginning in 1931 with patent #1,936,640 (issued in 1933), and later with patent #2,003,155, issued in 1935. Fig. 209. Blackhawk 49997 1/2-Drive Free-Wheeling Ratchet, with Insets for Detail, 1938. Fig. 209 shows a Blackhawk model 49997 1/2-drive gearless ratchet, with the markings "Made in U.S.A.", "Free-Wheeling Ratchet", and "U.S. Pats. RE19287 1927844 1936640 2003155". The overall length is 10.8 inches, and the finish is polished chrome. The handle design is the "Gripline" style previously seen on several extensions, a style known to have been in use by 1938. The left hand inset shows the date code of "-8", which together with the handle style indicates production in 1938. This is the (currently) our earliest date-coded example of the Gripline handle style. Fig. 210. Blackhawk 49997 1/2-Drive Free-Wheeling Ratchet, with Insets for Detail, 1942. Fig. 210 shows another Blackhawk model 49997 1/2-drive gearless ratchet, stamped "Made in U.S.A." with a "-2" date code, and with the patents "U.S. Pats. RE19287 1927844 1936640 2003155". The ratchet is also marked "Free-Wheeling Ratchet" and "Trade Mark Reg. ", although no trademark registration has been found. The handle design is the "Gripline" style previously seen on several extensions, and this style is known to have been in use by 1938. The Gripline handle and "-2" date code indicate a manufacturing date of 1942, which is consistent with wartime production suggested by the cadmium finish. Fig. 211. Blackhawk 49973 1/2-Drive Ratchet Adapter, 1942. Fig. 211 shows a Blackhawk model 49973 1/2-drive ratchet adapter, marked "Made in U.S.A." with "U.S. Pats. RE19287 1927844 1995009 2286917". The overall length is 2.4 inches. The ratchet adapter is finished in polished chrome, and is marked with a date code of "-2", consistent with production in 1942. Of the four patents marked on the tool, patent #1,995,009 covers the design of the basic ratchet mechanism. The key innovation here was to place the ratchet gear in the body and let the pawl assembly rotate with the drive stud. This gave the gear a larger circumference and allowed more teeth for a finer action. However, the later catalog No. 247 of 1947 gives the diameter of the model 49973 adapter as 1-5/16 inches at that time, and a 1953 Blackhawk catalog confirms the continued use of the 1-5/16 diameter. The figure below will show an example of a later model with the larger diameter. Fig. 212. Blackhawk 49973 1/2-Drive Ratchet Adapter, 1952. In Fig. 212 we see another model 49973 ratchet adapter, marked as above with "Made in U.S.A." and "U.S. Pats. RE19287 1927844 1995009 2286917". The overall length is 2.5 inches. This adapter is very similar to the one in the previous figure, but the body has a larger diameter of 1-5/16 inches. 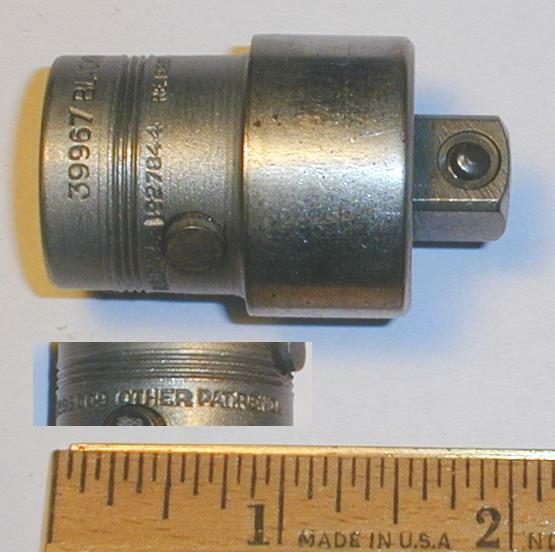 The date code is marked as a "2", but as this adapter has the larger diameter specified in 1947 and later, the date code indicates a production date of 1952. This tool was helpful in confirming the extension of the date code system beyond 1947. This unit was disassembled for cleaning and lubrication, and the ratchet mechanism was noted as using two pawls in a symmetrical arrangement. The earlier model has not yet been disassembled for comparison, but it may be that the increased body diameter was needed to allow the use of the stronger dual-pawl design. Fig. 213. Blackhawk 49979 1/2-Drive Drag Link Driver, with Inset for Top View, 1945. Fig. 213 at the left shows a 1/2-drive Blackhawk 49979 drag link driver, marked "Made in U.S.A." with a "-5" date code, and with a "U.S. Pat's. 1927844 RE.19,287" patent notice. The overall length is 1.8 inches, and the finish is chrome plating. The "-5" date code indicates production in 1945 or 1955, though the former date is probably more likely. In the mid 1930s Blackhawk updated the 3/4-drive model numbers to the 60000 series, using 60xxx numbers for sockets and 69xxx numbers for drive tools. For the sockets, the change to the 60000 series was not merely cosmetic, as the socket design was changed from tapered walls to straight walls. The 3/4-drive product line had previously offered sockets only in the tapered design, unlike the 1/2-drive line, which had offered both straight (66xx) and tapered (84xx) sockets. The change to the new numbering system appears to have taken place in 1937, as a price list dated in April of 1937 includes a cross-reference of old and new numbers, and states that both numbers can be used for ordering in 1937. The next several figures will show examples of 60000-series sockets and tools. Fig. 214. Blackhawk 3/4-Drive 60134 1-1/16 8-Point Socket, with Insets for Broaching and Marking Detail, ca. 1937. Fig. 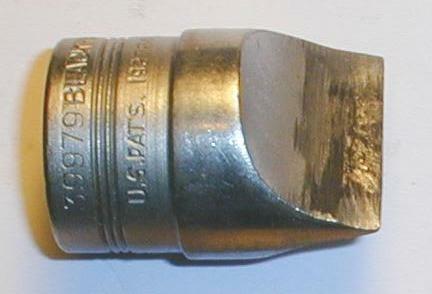 214 shows an early 3/4-drive Blackhawk 60134 1-1/16 8-point socket, marked "U.S.A." with a "Pat. Pend." notice. Fig. 215. Blackhawk 3/4-Drive 60042 1-5/16 Sockets, with Inset for Date Codes. Fig. 215 shows a pair of 3/4-drive Blackhawk model 60042 1-5/16 Lock-On sockets, both marked "Made in U.S.A." and with the "U.S. Pats. RE19287 1,927,844" patent notice. The insets show the date codes for the sockets, "3" on the left and "-6" for the right. The lefthand socket has a cadmium finish, which is consistent with a manufacturing date of 1943. The righthand socket is finished in polished chrome, which again is consistent with manufacture in 1946. These sockets contributed to the understanding of the date code system explained earlier, as the presence of a cadmium finish places the date of manufacture within the wartime years. Fig. 216. 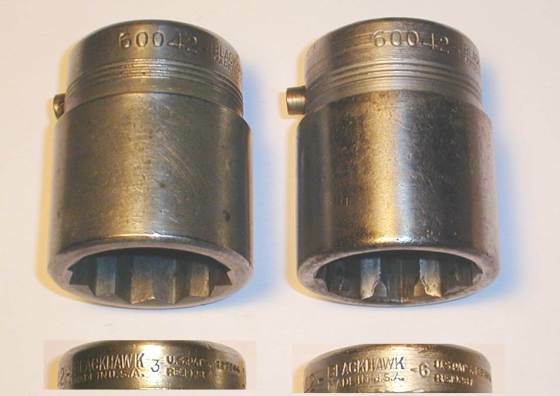 Blackhawk 3/4-Drive Lock-On Sockets, with Inset for Date Codes, from Left: 60042 (1-5/16), 60050 (1-9/16). Fig. 216 shows another paired comparison of 3/4-drive Lock-On sockets, this time with a model 60042 1-5/16 socket on the left (the same as shown in the previous figure), and a model 60050 1-9/16 socket on the right. Both are marked "Made in U.S.A." and "U.S. Pats. RE19287 1,927,844", as expected for Lock-On sockets. The somewhat odd-looking inset in the photograph shows the markings and date codes for the sockets. The socket on the left has the standard polished chrome plating and a digit code of "-6", while the righthand socket has a thin cadmium plating and a digit code of "4". 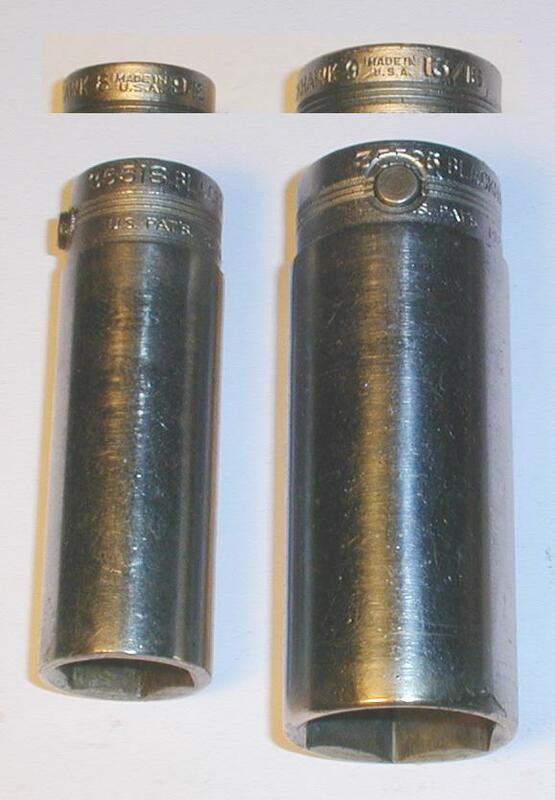 These sockets contributed to the understanding of the date code system explained earlier, and based on the codes were manufactured in 1946 and 1944 respectively. The next two figures show examples of the model 69999 ratchet, the successor to the 916N ratchet. Fig. 217. Blackhawk 69999 3/4-Drive Ratchet, with Insets for Side View and Marking Detail, 1939. Fig. 217 shows a 3/4-drive Blackhawk 69999 ratchet with a forged flat handle, fitted with a model 69989 drive plug. The face plate is stamped with the model and "U.S. Pats. RE19287 1927844", followed by a "-9" date code and an "FR" notation, as shown in the middle inset. The handle has forged-in markings "Blackhawk Mfg. Co. Milwaukee Wis." and "Made in U.S.A." on both sides, plus a small "DIF" forge mark on one side (see lower inset). The overall length is 15.9 inches, and the finish is chrome plating. The "-9" date code indicates production in 1939, as this ratchet model had been discontinued by 1947 or earlier. This ratchet was acquired as part of a No. 14BD 3/4-drive socket set, and most of the other pieces in the set were also marked for 1939 production. The meaning of the "FR" code following the date digit is not yet known, but has been observed on a number of Blackhawk tools. Fig. 218. Blackhawk 69999 3/4-Drive Ratchet, with Inset for Detail, 1940. Fig. 218 shows another example of the Blackhawk 69999 ratchet. The forged flat handle is marked "Blackhawk Mfg. Co. Milwaukee, Wis." and "Made in U.S.A." in raised letters, and the face plate is stamped "U.S. Pats. RE19287 1927844" followed by a "-0 FR" code. The overall length is 15.9 inches. Most of the finish has been lost, but was originally chrome plating. The inset shows the date code marking "-0", which for this tool indicates production in 1940. (This ratchet model had been discontinued by 1947 or earlier.) An additional code "FR" follows the date code digit, a notation that has been observed on other Blackhawk tools as well. This might stand for "Factory Reconditioned", but meaning is still uncertain. Fig. 219. Blackhawk 69998 3/4-Drive Flex Handle, with Insets for Construction and Marking Detail, 1943. Fig. 219 shows a 3/4-drive Blackhawk 69998 flex-head handle, marked "Made in U.S.A." with a "-3" date code, and with a "U.S. Pats. RE19287 1927844" patent notice. The overall length is 19.8 inches, and the finish is cadmium plating. The Gripline handle is provided with a cross-bar hole, and in addition has been drilled out for use with an extension bar. The upper right inset shows the details of this construction. Fig. 220. Blackhawk 69994 3/4-Drive 17 Inch Extension, with Inset for Marking Detail, ca. 1935-1938. Fig. 220 shows a 3/4-drive Blackhawk 69994 17 inch extension, marked "Made in U.S.A." with a "U.S. Pat's. 1,927,844 RE19,827 1,982,008" patent notice. The overall length is 17.0 inches, and the finish is chrome plating. 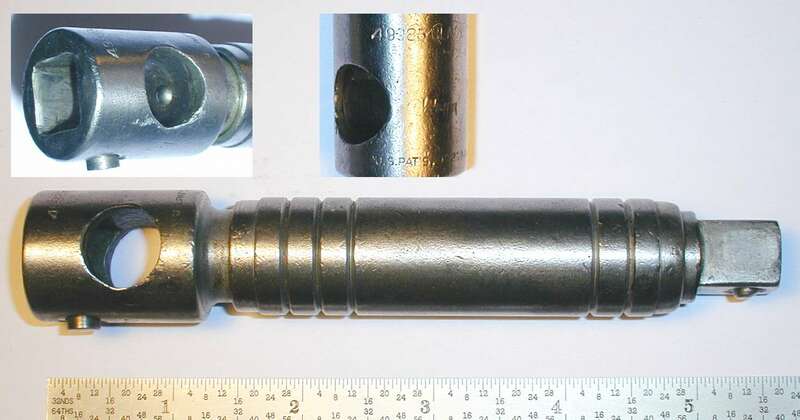 The drive head includes a cross-bar hole for use with a 13/16 diameter cross-bar, as described for the Blackhawk T8XN Extension shown previously. The Model 69994 extension was the successor to the T17XN model produced earlier. This extension isn't marked with a date code, suggesting that it may have been made before the advent of the date code system. Fig. 221. Blackhawk 69994 3/4-Drive 15/16x1-3/16 Double Socket, with Inset for Broaching. Fig. 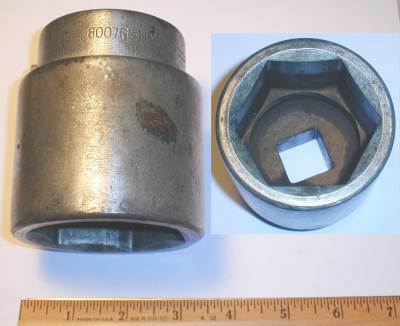 221 shows an unusual 3/4-drive Blackhawk 69966 15/16x1-3/16 double socket, possibly intended for lug-nut applications. The socket is marked "Made in U.S.A." with a "9" date code and the standard "U.S. Pats. 1927844 RE.19827" patent notice. The overall length is 3.3 inches, and the finish is cadmium plating. The socket is fitted with a Lock-On release button in the center, allowing an extension to be inserted and locked from either side. We haven't yet found a catalog reference for this tool, and it's possible that it might have been a special-order item. Without any other guidelines for the manufacturing date, the "9" date code could indicate production in either 1939 or 1949. During the 1920s Blackhawk's largest drive size was 7/8-drive, and production of this size continued into the mid 1930s. The 7/8-drive size was still listed in a 1935 catalog, but a price list from April of 1937 shows only the 1 inch drive size. The new 1 inch drive sockets and tools were given model numbers in an 80000 series, with 80xxx numbers for sockets and 89xxx number for drive tools. The 1 inch drive tools used interchangeable handles to reduce the already considerable weight of these massive tools. The standard finish was cadmium plating. Blackhawk also produced Lock-On sockets in 1-inch drive sizes, as the next figure shows. Fig. 222. 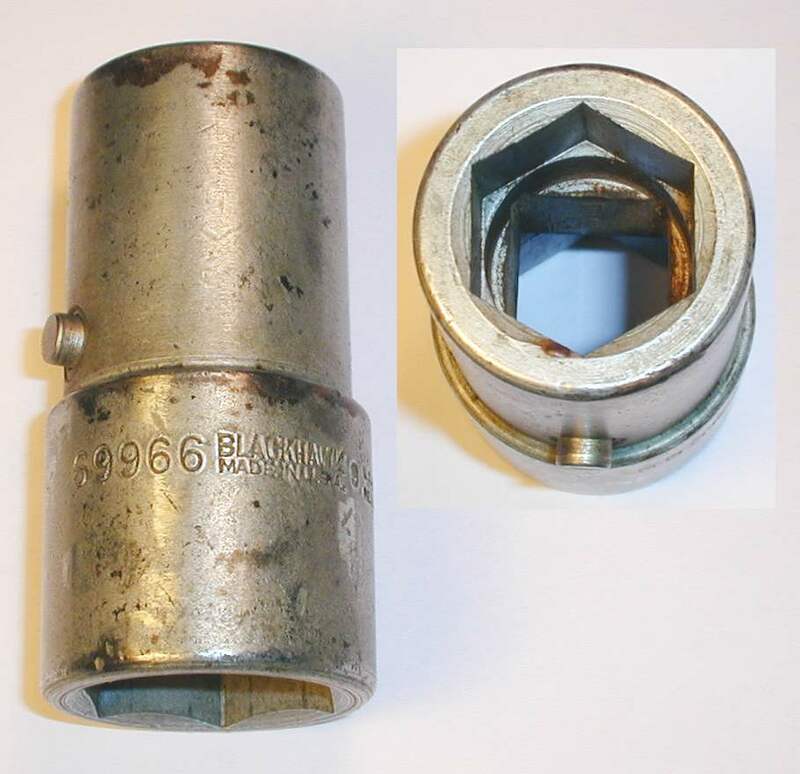 Blackhawk 1 Inch Drive 80076 2-3/8 6-Point Lock-On Socket, with Inset for Broaching, 1945. Fig. 222 shows a Blackhawk 80076 2-3/8 socket, marked "Made in U.S.A." and "U.S. Pats. RE19287 1927844". The finish on the socket is cadmium plating, which according to the catalogs was the standard finish for the 1-inch drive tools. The date code is "5", which could indicate production in 1945 or 1955, but as the socket was acquired with other tools dating to the mid 1940s, the likely manufacturing date is 1945. The Blackhawk 1-inch drive sockets were available in 6-point (single hex) broachings, with sizes ranging from a 1-1/16 model 80034 to the 3-1/8 model 80100. 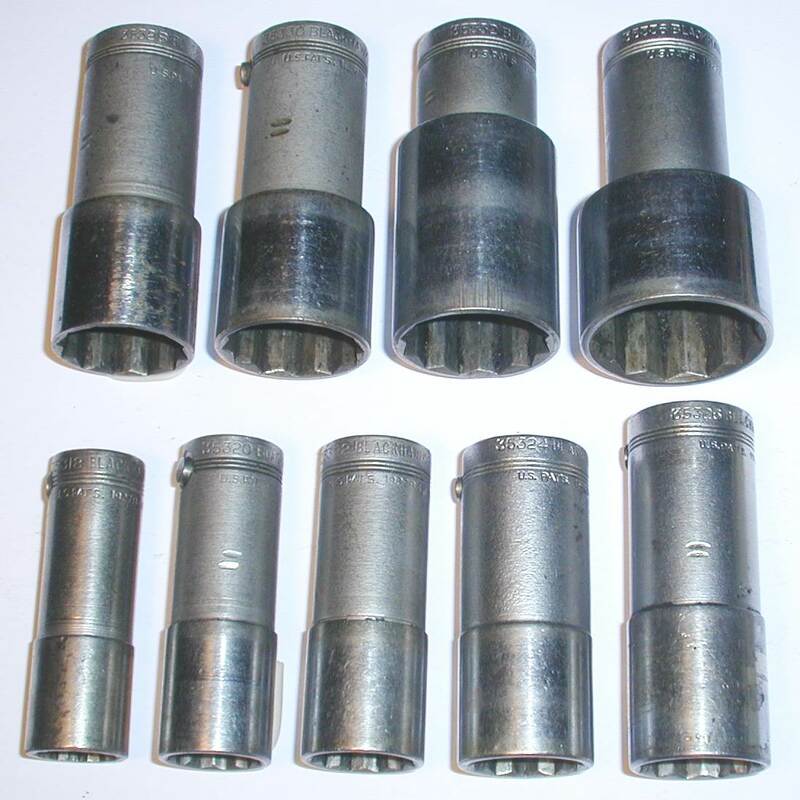 Sockets with 4-point (single square) broachings were also available, but in only three sizes, 1-1/16 (model 81034), 1-1/4 (model 81040), and 1-7/16 (model 81046). Fig. 223. Blackhawk 89987 1 Inch Drive Ratchet, Top View, 1943. Fig. 223 shows a Blackhawk 89987 1 inch drive ratchet, marked "Made in U.S.A." and "U.S. Pats. 1927844 RE.19287 1995009", plus an additional "Other Pat. Pend." notice. The ratchet mechanism uses a 28-tooth gear and is covered by the same patent #1,995,009 used by the ratchet adapters described above. The pending status is for patent #2,286,917 which was issued to S. Mandl in 1942. Fig. 224. Blackhawk 89987 1 Inch Drive Ratchet, Side View, 1943. Fig. 224 at the left shows the 89987 ratchet from the side. The ratchet has a stub handle designed to accept two types of handle extensions, a model 89997 bar that fits into the inner bore, or a model 89989 tubular handle that slids over the outside. In the former case, the lock button on the 89997 bar fits into the hole in the ratchet handle, and in the latter case, the lock button on the ratchet slips into a hole in the tubular handle. In either configuration, the 89989 tubular extension and 89997 bar can be coupled together to provide even greater leverage. Fig. 225. 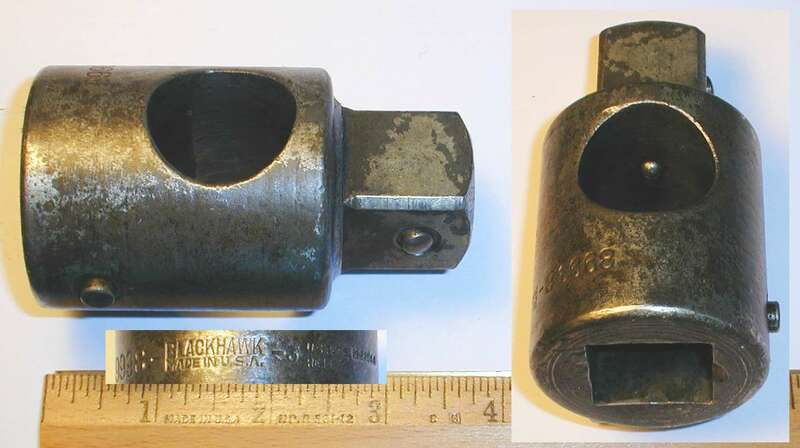 Blackhawk 89998 1 Inch Drive Sliding Tee Head, with Insets for End View and Markings, 1943. Fig. 225 shows a Blackhawk 89998 1 inch drive sliding Tee head, marked "Made in U.S.A." and "U.S. Pats. 1927844 RE.19287". The overall length is 3.5 inches, and the finish is cadmium plating. The sliding head was intended for use with the model 89997 bar, a hefty tool with a 23 inch length and 1-1/8 inch diameter. The 89997 bar also served as the handle for the 89987 ratchet head. 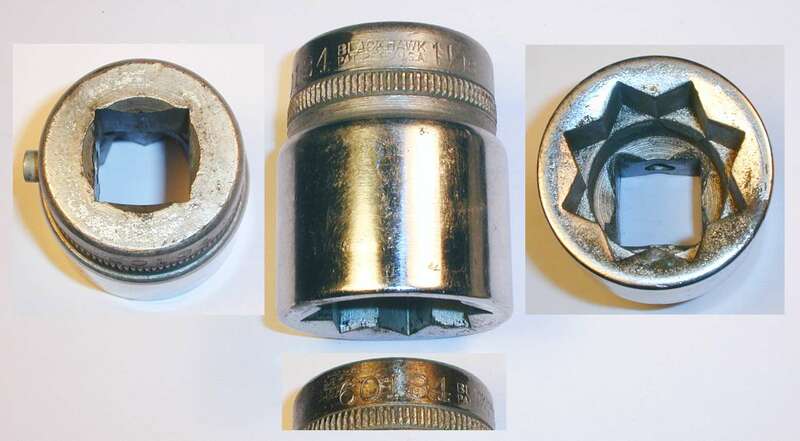 The lower left inset shows the "-3" date code marking, which in this case could indicate production in either 1943 or 1953, as cadmium finishes were standard for the 1 inch drive tools and sockets. However, the 89987 ratchet acquired in the same lot had a patent pending notice that makes 1943 the likely production year. The righthand inset shows an end view of the tool, with the end broached for additional use as a short extension. The cross-bar hole is equipped with a detent ball to help hold the position on the bar. Blackhawk's line of 7/16-drive tools was one of their more distinctive products, and no other company is known to have produced tools in this drive size. According to the Blackhawk sales literature, the enabling factor for these tools was the extra strength of the Hexite steel alloy developed by Blackhawk. By the mid 1930s Blackhawk had developed an alloy steel named "Hexite", and claimed it to be 70% stronger than the typical chromium-vanadium alloys in use. As if to back up their claims, Blackhawk designed a new line of sockets and drive tools with 7/16-drive, and extended the claim that these were as strong as conventional 1/2-drive tools but only slighty larger than the corresponding 3/8-drive tools. With these tools (or so the marketing claim went), the mechanic could dispense with the trouble and expense of maintaining both 3/8- and 1/2-drive sets and go entirely 7/16-drive. Blackhawk produced a full range of 7/16-drive sockets to go with the drive tools, including shallow, deep, and universal sockets. Since this line of tools was supposed to replace both 3/8- and 1/2-drive, the socket sizes ranged from 5/16 up to 1-1/4, in order to cover the normal size ranges of both the larger and smaller drive sizes. A recently acquired catalog No. 240 of 1940 provided the missing documentation, as the catalog states that the 7/16 drive line (called "Nuggets" by Blackhawk) was introduced in early 1938. 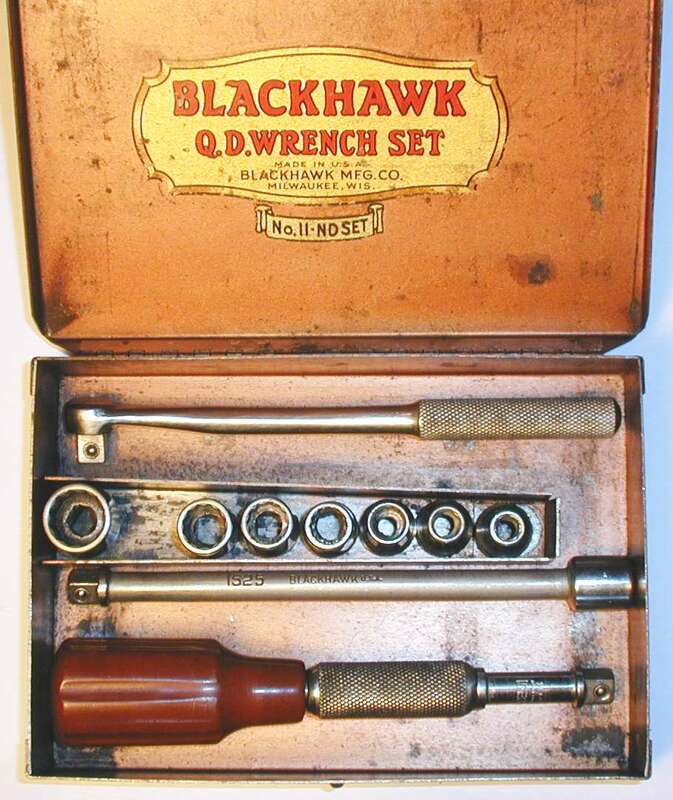 By 1940 a full range of 7/16-drive tools was available, and Blackhawk was heavily promoting the new tools, even to the point of offering a discount for a trade-in of older tools of any make. Production of the 7/16 drive tools continued until at least into the late 1950s, and possibly longer, as two of the Blackhawk catalogs issued by the New Britain Machine Company (after their acquisition of Blackhawk in 1955) still offer 7/16 drive tools. However, the 7/16 drive line had definitely been discontinued by the time of the 1963 W-203 catalog. The table below lists all of the 7/16-drive tools with the model number, description, and size, along with a link to an example when available. (Examples will be available for most of the models, but it will take some time to prepare the photographs.) This list is a composite of the 7/16-drive tools offered over time, and not all models were available at all times. The flags indicating inclusion in one of the popular 7/16-drive sets are based on the 1947 Blackhawk catalog, and may not be definitive for other years. Table 4. Blackhawk 7/16-Drive Tools by Model Number. Fig. ?? 12-Point Standard Sockets To be added. Fig. 226. Blackhawk 7/16-Drive 352xx 8-Point Sockets, with Inset for Date Codes, from Left: 35212 (3/8), 35214 (7/16), 35216 (1/2). Fig. 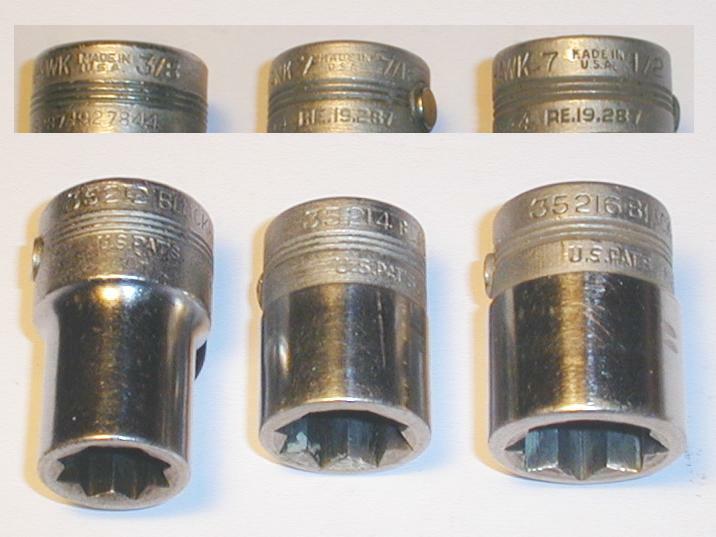 226 shows several sockets in the 8-Point 352xx series, all marked "Made in U.S.A." and with the "U.S. Pats. 1927844 RE19287" patent notation. The model numbers and sizes are, from the left, 35212 (3/8), 35214 (7/16), and 35216 (1/2). The inset shows the date codes for the middle and righthand socket, both marked "7" indicating production in 1947. The socket on the left, a model 35212 of size 3/8, isn't marked with a date code, and shows some other differences when compared with the other two. In particular, the socket is somewhat longer, and has a slightly larger diameter base. With the help of some recently acquired additional examples, these differences can now be understood and have a simple explanation. The model 35212 socket is apparently one of the first generation of 7/16-drive tools, and the base has a larger diameter in order to leave the walls thick enough for the release button. Blackhawk hadn't yet developed the insertable retaining sleeves of patent #2,190,081, and therefore had to maintain some minimum base diameter for the button. The larger base diameter in turn meant that the socket had to be longer, so that the broached end could still reach into tight places. Once the insertable retaining sleeves were developed, Blackhawk was able to reduce the base diameter of the smaller sockets and make them shorter. (We'll show several paired comparisons to illustrate this, once the phototgraphs have been prepared.) The insertable sleeves were needed only for the smaller sockets; based on the observed samples, sizes 9/16 and smaller needed sleeves. If you look carefully, the inset shows that the middle socket has an insertable sleeve. The filing date for patent #2,190,081 was Jan. 22, 1938, and it's reasonable to assume that Blackhawk would have started using the insertable sleeves around the same time. This suggests that the sockets with the larger bases and no datecodes were most likely made in 1937, or very early in 1938. Fig. 227. Blackhawk 7/16-Drive 353xx 12-Point Deep Sockets, 1947. Fig. 227 shows a set of Blackhawk 7/16-drive 12-point deep sockets in the 353xx series, all marked "Made in U.S.A." and with the "U.S. Pats. RE19287 1927844" patent notation. The sizes range from the 9/16 model 35318 in the lower left to the 1-1/8 model 35338 in the upper right. 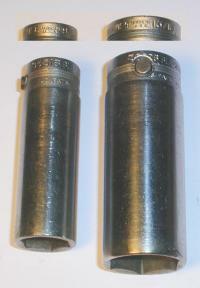 Sockets in the smaller sizes (9/16 and under) needed an insertable sleeve to retain the release button, due to the narrow base of sockets made in 1938 and later. Fig. 228. Blackhawk 7/16-Drive 35314 7/16 Deep Socket, 1941. Fig. 228 shows a Blackhawk 35314 7/16 deep socket with an extension sleeve securing the release button. The socket is marked "Made in U.S.A." with a "U.S. Pat's. 2190081 RE.19,287" patent notice. The date code is marked "1", indicating production in 1941. This is currently our only available example noting patent #2,190,081. Fig. 229. 354xx Universal Sockets To be added. Blackhawk also produced a 355xx series of 7/16-drive deep sockets with 6-point broachings, intended primarily for spark-plug applications. Fig. 230. Blackhawk 7/16-Drive Spark Plug Sockets, with Inset for Date Codes, from Left: 35518, 35526. Fig. 230 shows two examples of this series, a 9/16 model 35518 socket on the left and a 13/16 model 35526 on the right. Both are marked "Made in U.S.A." with "U.S. Pats. RE19287 1927844". These sockets are fitted with rubber inserts to grip (and cushion) the spark plug ceramic. The inset shows the date codes, "8" for the 35518 and "9" for the 35526 model, indicating production in 1938 and 1939 respectively. Fig. 231. 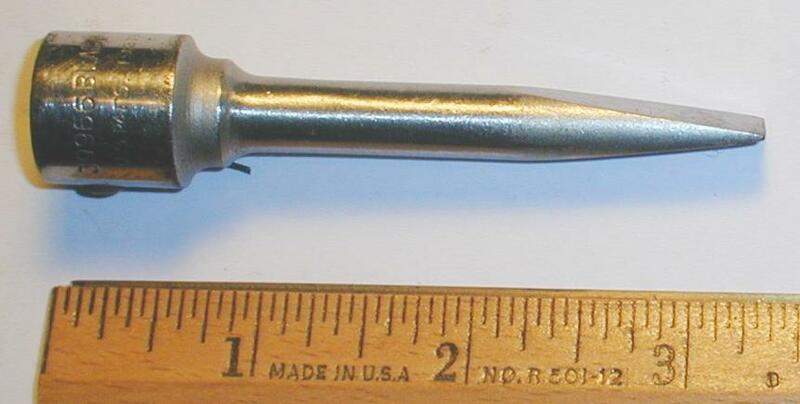 Blackhawk 39966 7/16-Drive Screwdriver Bit, 1947. Fig. 231 shows a Blackhawk 39966 screwdriver bit of width 11/32, marked "Made in U.S.A." with "U.S. Pats. 1927844 RE19287". The overall length is 3.3 inches. The date code is "7", indicating production in 1947. Fig. 232. Blackhawk 39976 7/16-Drive Drive Handle, 1947. Fig. 232 shows a Blackhawk model 39976 7/16-drive insulated handle, marked "Made in U.S.A." with "U.S. Pats. RE19,287 1,927,844". The overall length is 5.5 inches. The handle is marked with a date code of "7", indicating production in 1947. Fig. 233. Blackhawk 39977 7/16-Drive Short T-Handle, with Inset for Reverse. Fig. 233 shows a rather distinctive Blackhawk 7/16-drive model 39977 short T-handle, with balls on the handle ends for a better grip. The handle is marked "Blackhawk Made in U.S.A." and "U.S. Pats. RE19287 1927844" on the reverse, and the overall length is 7.9 inches. The catalogs referred to this as a "Speed Ball Handle", and noted that the weighted balls give it momentum for spinning down nuts. As far as is known, this tool was offered only in 7/16 drive. No date code was found on this tool, possibly due to the rust and pitting on the surface, or perhaps none was marked. It also might have been produced before the date codes were established; the earliest dated examples available are from 1938, and the 7/16 drive line may have originated somewhat earlier. Fig. 234. Blackhawk 39978 7/16-Drive Universal, 1947. Fig. 234 at the left shows a Blackhawk 39978 universal, marked "Made in U.S.A." with "U.S. Pats. 1927844 RE19,287". The overall length is 1.5 inches. Fig. 235. Blackhawk 39979 7/16-Drive Drag Link Socket, 1947. Fig. 235 shows a Blackhawk 39979 drag link socket of width 15/16, marked "Made in U.S.A." with "U.S. Pats. 1927844 RE19,287". The overall length is 1.3 inches. Blackhawk offered four extension models, with nominal lengths of 3, 6, 10, and 18 inches. The 6 inch model 39983 was supplied with a rotating grip, but the other models were just simple extensions. Fig. 236. Blackhawk 39982 7/16-Drive 3 Inch Extension, 1938. Fig. 236 at the left shows a Blackhawk 39982 3 inch extension, marked "Made in U.S.A." with "U.S. Pats. 1927844 RE19287". The overall length is 3.0 inches. The extension is equipped with a cross-bar hole to allow use as a T-handle, a common feature for extensions during the 1930s and 40s. The Blackhawk-supplied handle was the model 39986 Handle Bar shown below. The next figures show two generations of the Blackhawk 39983 extension. Fig. 237. Blackhawk 39983 7/16-Drive 6 Inch Extension, with Insets for Construction and Marking Detail, ca. 1937-1939. Fig. 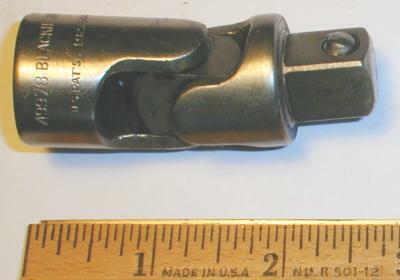 237 shows an early 7/16-drive Blackhawk 39983 6 inch extension with a rotating hand grip, stamped "Blackhawk" with the model number and "Made in U.S.A." on the drive end, with a "U.S. Pats. RE.19,287 1927844" patent notice below (see composite inset). The rotating handgrip has the Gripline style introduced by Blackhawk in 1938. The absence of a date code marking on the tool suggests a manufacturing date from 1937 to early 1939, just before the date codes were added to drive tools. The extension is equipped with a cross-bar hole to allow use as a Tee-handle, a common feature for extensions during the 1930s and 1940s. The detent ball used to secure the cross-bar can be seen in the right inset; this convenience feature was generally found only on top-grade tools. The Blackhawk-supplied handle was the model 39986 Handle Bar shown in a later figure. Fig. 238. Blackhawk 39983 7/16-Drive 6 Inch Extension, with Inset for Construction Detail, 1947. Fig. 238 shows a later 7/16-drive Blackhawk 39983 6 inch extension with a rotating hand grip, marked "Made in U.S.A." with a "U.S. Pat's. 1927844 RE.19,287" patent notice. The overall length is 6.1 inches, and the finish is polished chrome. This extension has the bullet-style handgrip used in 1947 and later, and a small amount of the factory-applied red highlight paint can be seen in the handle grooves. The date code is marked "-7" (see inset), indicating production in 1947. As with the previous example, the extension is equipped with a cross-bar hole and detent ball for use as a Tee-handle. Fig. 239. Blackhawk 39990 7/16-Drive 10 Inch Extension, with Inset for Marking Detail. Fig. 239 shows a 7/16-drive Blackhawk 39990 10 inch extension, stamped "Made in U.S.A." with "U.S. Pat's. 1927844 RE.19,287" on the drive head. Fig. 240. Blackhawk 39981 7/16-Drive 18 Inch Extension, with Inset for Detail, 1948. Fig. 240 shows a 7/16-drive Blackhawk 39981 18 inch extension, stamped "Made in U.S.A." and "U.S. Pats. 1927844 RE.19287" on the drive head. The model was the longest of the 7/16-drive extensions. The overall length is 18.0 inches. This extension is marked with a date code of "-8", which could represent either 1938 or 1948. However, date code markings are believed to have started in 1939, making 1948 the likely manufacturing date. Fig. 241. Blackhawk 39984 7/16-Drive Flex Handle, with Inset for Detail, 1942. Fig. 241 shows the Blackhawk model 39984 flex-head handle, marked "Made in U.S.A." with "U.S.Pats. 1927844 RE19287". The overall length is 8.1 inches. The handle features the "Gripline" style, in use from the late 1930s through 1946. This tool is marked with a date code of "-2", which together with the handle style indicates production in 1942. Although the handle does not have a cross-bar hole, it has been drilled out for an extension bar. Blackhawk referred to flex-head handles as "hinged offsets" in the catalog, a notation also used by Plomb Tools. (See for example the Plomb 5467 Hinge Handle.) In addition to this model, Blackhawk also produced a model 39985 15 inch flex handle, as shown in the next figure. The next figures show two generations of the model 39985 flex-head handle. Fig. 242. Blackhawk 39985 7/16-Drive Flex-Head Handle, with Inset for Marking Detail, 1939. Fig. 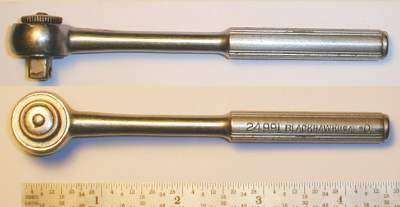 242 shows an earlier 7/16-drive Blackhawk model 39985 flex-head breaker bar, marked "Made in U.S.A." with a "9" date code and "FR" code, followed by a barely legible "U.S.Pat's. RE19287 1927844" patent notice. The overall length is 14.9 inches, and the finish is chrome plating. The handle on this example is the "Gripline" style used by Blackhawk from 1937 through 1946. The "9" date code with the Gripline handle indicates production in 1939. The handle is provided with a cross-bar hole for use as a Tee-handle, and also has been drilled longitudinally to accept an extension bar. The model 39986 handle bar (shown later) was available for both applications. Fig. 243. Blackhawk 39985 7/16-Drive Flex-Head Handle, with Inset for Detail, 1947. Fig. 243 at the left shows a later Blackhawk model 39985 flex handle, marked "Made in U.S.A." with "U.S.Pats. 1927844 RE19287". The overall length is 15.1 inches. As with the previous example, the handle is equipped with a cross-bar hole for use as a T-handle, but the closed end precludes the use of an extension bar. One interesting detail noted during close examination is that the handle is actually hollow, perhaps to lighten the weight. Presumably the handle was hollowed during the forging, and then the end was closed to make the bullet shape. Fig. 244. Blackhawk 39986 7/16-Drive Handle Bar, 1942. In Fig. 244 we see an example of the cross-bar made for use with extensions and breaker bars, the Blackhawk model 39986 handle bar. The bar is marked "Made in U.S.A." with a date code "2", indicating production in 1942. Included in the photograph is a 39982 extension to show the typical use. Fig. 245. 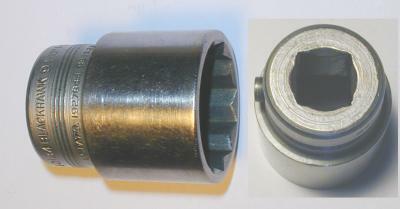 Blackhawk 39967 7/16-Drive Ratchet Adapter, with Inset for Detail, 1941. Fig. 245 shows a Blackhawk 39967 7/16-drive ratchet adapter, marked "Made in U.S.A." with the patents "U.S. Pats. 1927844 RE19287 1995009", plus an "Other Pat. Pend." notation. The overall length is 2.0 inches, and the finish is chrome plating. The inset shows the patent pending notation, which refers to patent #2,286,917; this patent was filed by S. Mandl on May 3, 1941 and issued June 16, 1942. The adapter is also marked with a "1" date code, which with the patent pending status indicates production in 1941. This ratchet adapter is very similar to the Model 49973 Ratchet Adapter discussed previously; the 1/2-drive model was made in 1942 and bears the newly issued patent number. The patent pending notation on this tool helps to confirm the interpretation of the date codes. Fig. 246. Blackhawk 39996 7/16-Drive Two-Length Ratchet, with Inset for Detail, 1951. Fig. 246 shows a 7/16-drive Blackhawk 39996 "Bald-Head" ratchet with a surprising feature -- the "bullet" handle can be unscrewed and extended for extra leverage. The ratchet is marked "Made in U.S.A." with the patent notations "U.S. Pats. 1995009 2282148 2520652"; note the omission of the Lock-On patents. The overall length is 7.4 inches in the compact form and 9.2 inches when extended. The ratchet is marked with a "-1" date code, which together with the bullet-style handle indicates manufacture in 1951. The extended form of the ratchet is shown in Fig. 247 below. The handle can be extended by unscrewing the bullet handgrip (counterclockwise) until free, then sliding it out to the extended position. At this point continued counterclockwise rotation engages a second threaded section, and the handgrip is rotated until it seats. Fig. 247. Blackhawk 39996 7/16-Drive Two-Length Ratchet, Extended Form, 1951. Of the patents listed here, patent #1,995,009 covers the ratchet mechanism, the same design as that used in the ratchet adapters. This particular model has a 25-tooth action. Patent #2,282,148 covers Blackhawk's original extendable handle design, which used a removable sleeve threaded on both ends. Patent #2,520,652 describes the present improved design, a much more elegant approach that keeps the handle captive and protects the threads from damage. Fig. 248. Blackhawk 39997 7/16-Drive Gearless Ratchet, 1947. Fig. 248 shows a Blackhawk 7/16-drive model 39997 gearless ratchet with the streamlined "bullet" end piece, marked "Made in U.S.A." and "U.S. Pats. RE19287 1927844 1936640 2003155". The overall length is 9.9 inches. The ratchet is marked with a "7" date code, indicating manufacture in 1947. The background and operation of the gearless ratchets was discussed earlier for the model 49997 gearless ratchet. The next figures show two generations of the Blackhawk 39999 7/16-drive speeder, illustrating the transition from the Gripline handle style to the streamlined "Bullet" style. Fig. 249. Blackhawk 39999 7/16-Drive Speeder, with Inset for Marking Detail, 1941. Fig. 249 at the left shows a 7/16-drive Blackhawk model 39999 speeder with a Gripline style end piece. The shank is stamped "Made in U.S.A." with a "-1" date code, and with the "U.S. Pats. RE.19,287 1,927,844" patent notice (see inset). The overall length is 16.8 inches. The finish is chrome plating with some loss due to wear and rust. The "-1" date code with the Gripline style handle indicates that this tool was made in 1941. Fig. 250. Blackhawk 39999 7/16-Drive Speeder, with Inset for Reverse, 1947. Fig. 250 at the left shows a later Blackhawk 39999 speeder with the streamlined "bullet" end piece. The reverse is marked "Made in U.S.A." with a "7" date code, and with the "U.S. Pats. RE19287 1927844" patent notice (see inset). The overall length is 16.6 inches. The "7" date code with the streamlined handle indicates manufacture in 1947. This tool was one of the examples that helped to decode the interpretation of the Blackhawk date codes. Blackhawk offered a number of tool and socket sets built around the 7/16-drive tools. These included the 74R "Treasure Chest" set, and the 30K and 49K sets using a distinctive torpedo-shaped case. In 1947 Blackhawk introduced a quirky torpedo-shaped tool box for its 7/16-drive tools. Officially known as the No. 19574 "Bullet-Type Wrench Case", the cylindrical box featured a handle on top and wheels on the bottom, allowing it to be rolled underneath a car being serviced. Two 7/16-drive socket sets using the 19574 toolbox were available, the 30K and 49K sets with 30 and 49 pieces respectively. We have an example of the 19574 toolbox, but it's currently being prepared for display. We'll add a photograph at a later time. Fig. 251. Blackhawk 19574 "Torpedo" Tool Box, To Be Added. From 1930 onward most most of Blackhawk's development work went into the Lock-On series tools for drive sizes 7/16 and up. However, the company also offered a full line of tools in the 1/4 and 3/8 drive sizes. Blackhawk's line of 1/4-drive sockets and tools were technically part of the older Q.D. (Quick-Disconnect) line, with conventional friction balls in the drive studs, since the tools were too small to need (or fit) the Lock-On mechanism. But as Blackhawk improved its Lock-On tools with highly polished surfaces and chrome-plated finishes, the 1/4-drive tools were improved as well, giving them the same appearance as the Lock-On line. The 3/8-drive line followed a different trajectory. Initially Blackhawk offered its 3/8-drive tools as part of the Lock-On line, but when release buttons were developed, it turned out to be completely impractical to fit the buttons in the 3/8-drive sockets. In response to this, Blackhawk developed the 7/16-drive line of Lock-On tools, which covered the socket sizes normally serviced by 3/8-drive. Blackhawk continued to offer 3/8-drive tools with Lock-On studs even after the 7/16-drive tools were available. However, relatively few of these 3/8-drive Lock-On tools were sold, probably due to the inconvenience of needing a disconnect tool in the absence of a release button. Eventually though, Blackhawk realized its mistake and went back to offering its 3/8-drive tools with conventional friction balls. The switch back to friction balls appears to have been made around 1947, possibly as part of the changeover to the new handle styles. In this section we'll look at examples of the 1/4-drive and 3/8-drive tools. Fig. 252. Blackhawk 1521 1/4-Drive Obstruction Offset Handle, with Inset for Side View, ca. 1930-1936. Fig. 252 shows a 1/4-drive Blackhawk 1521 offset handle, stamped "U.S.A." on the shank. 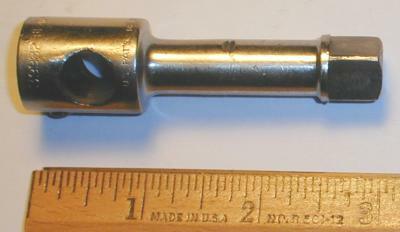 This offset handle was acquired as part of the Blackhawk 11-ND Socket Set shown in a later figure. Fig. 253. Blackhawk 1523 1/4-Drive Handle with Rotating Grip, ca. 1930-1936. Fig. 253 shows a 1/4-drive Blackhawk 1523 drive handle with a rotating grip, stamped "U.S.A." on the shank. The handle end is equipped with a 1/4-drive opening (not shown) for use as an extension. This drive handle was acquired as part of the Blackhawk 11-ND Socket Set shown in a later figure. Fig. 254. Blackhawk 1533 1/4-Drive Stubby Handle, ca. 1930. Fig. 254 shows a 1/4-drive Blackhawk 1533 stubby drive handle, marked only with the model number. The handle end is equipped with a 1/4-drive opening for use as an extension. This drive handle was acquired as part of the Blackhawk 15-ND Socket Set shown in a later figure. The next two figures show examples of the Blackhawk 1525 1/4-drive extension, first in its standard form and then in a less common rotating-grip version. Fig. 255. Blackhawk 1525 1/4-Drive Extension. Fig. 255 shows a 1/4-drive Blackhawk 1525 extension, stamped "U.S.A." on the shank. The overall length is 5.1 inches, and the finish is chrome plating. 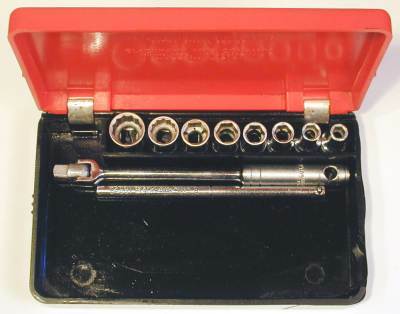 This extension was acquired as part of the Blackhawk 11-ND Socket Set shown in a later figure. Fig. 256. Blackhawk 1525 1/4-Drive Extension with Rotating Grip, ca. 1930. Fig. 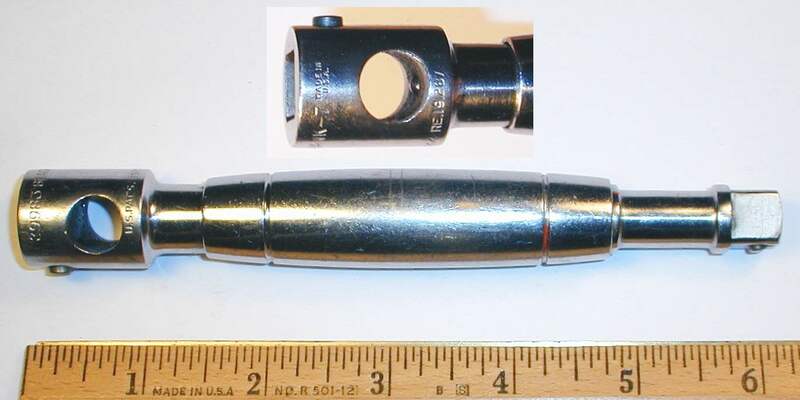 256 shows a 1/4-drive Blackhawk 1525 extension with a rotating grip, stamped "U.S.A." on the shank. This extension was acquired as part of the Blackhawk 15-ND Socket Set shown in a later figure. Fig. 257. Blackhawk 1541 1/4-Drive Screwdriver Socket, with Inset for Marking Detail, ca. 1930. Fig. 257 shows a 1/4-drive Blackhawk 1541 screwdriver socket, stamped "U.S.A." on the head. The overall length is 3.5 inches, and the finish is chrome plating. This screwdriver socket was acquired as part of the Blackhawk 15-ND Socket Set shown in a later figure. Currently we don't have a catalog reference for this tool. Fig. 258. Blackhawk No. 11-ND 1/4-Drive Q.D. Socket Set, ca. 1930-1936. Fig. 258 shows a 1/4-drive Blackhawk No. 11-ND Q.D. 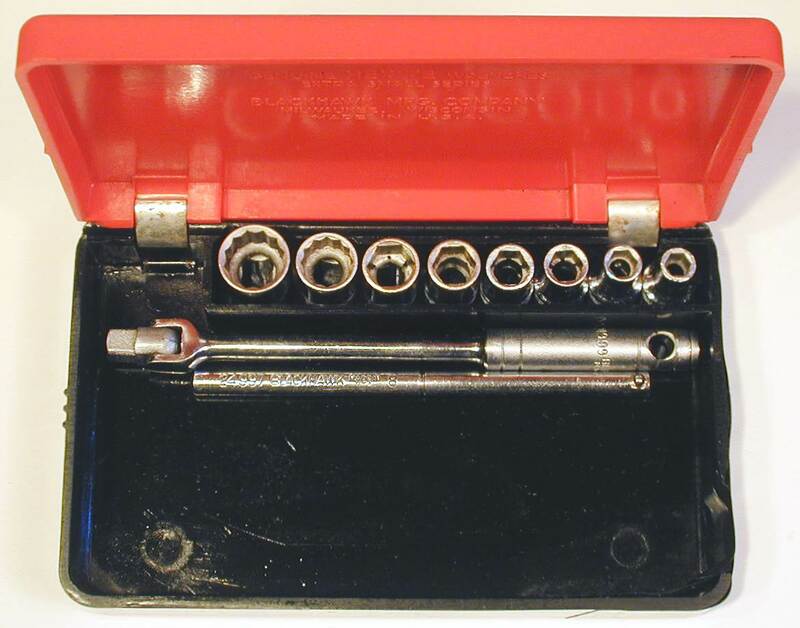 socket set, consisting of an offset handle, a straight handle with a swivel grip, an extension, and eight sockets (with one missing). The inside of the cover has a fancy decal with a bold "Blackhawk Q.D. Wrench Set", followed by "Blackhawk Mfg. Co." with "Milwaukee Wis." and "Made in U.S.A." in smaller type. A banner below identifies this as a No. 11-ND set. The socket models and sizes are, from the left, 1514 (7/16), 1511 (11/32), 1510 (5/16), 1509 (9/32), 1508 (1/4), 1507 (7/32), and 1506 (3/16). The missing socket was supposed to be a model 1512 of 3/8 size. Most of the sockets are broached with double-hex (12-point) openings, but the smallest two have hex openings. The No. 11-ND socket set was first listed in catalog MG530 of 1930, which refers to it as a "Midget Socket Set". The same catalog also offered a similar No. 16-ND set with the same drive tools plus several small ignition wrenches. The No. 11-ND set remained available at least through 1936. Fig. 259. Blackhawk 15xx 1/4-Drive Sockets, with Inset for Broaching, ca. 1930-1936. Fig. 259 at the left shows the four largest sockets from the No. 11-ND set, each marked "Blackhawk U.S.A." on the base. The models and sizes are, from the left, 1509 (9/32), 1510 (5/16), 1511 (11/32), and 1514 (7/16). Our next figure shows another Blackhawk 1/4-drive socket set, clearly identified by its decal and yet presenting some mysteries as to its age and contents. Fig. 260. Blackhawk No. 15-ND 1/4-Drive Q.D. Socket Set, ca. 1930. Fig. 260 shows a 1/4-drive Blackhawk No. 15-ND Q.D. socket set, consisting of drive tools, screwdriver bits, and eight sockets of mixed hex and double-hex broachings. The inside of the cover has a fancy decal with a bold "Blackhawk Q.D. Wrench Set", followed by "Blackhawk Mfg. Co." with "Milwaukee Wis." and "Made in U.S.A." in smaller type. A banner below identifies this as a No. 15-ND set. The socket models and sizes are, from the left, 1514 (7/16), 1512 (3/8), 1511 (11/32), 1510 (5/16), 1509 (9/32), 1508 (1/4), 1507 (7/32), and 1506 (3/16). The four larger sockets (at the left) are broached with double-hex (12-point) openings, and the four smaller sockets have hex openings. The drive tools in the set are the 1521 offset handle, 1525 extension with a swivel grip, a 1533 stubby drive handle, and two flat screwdriver bits numbered 1540 and 1541. A careful review of the 1930s Blackhawk catalogs failed to find a reference to this particular set model, so at the present time we're unsure of the original specification. In the Blackhawk socket set system the model number normally indicates the total number of pieces in the set, which would imply that this set should have 15 pieces, two more than are currently present. The next two figures show examples of Blackhawk's 1/4-drive ratchets. Fig. 261. Blackhawk 24991 1/4-Drive Ratchet, with Inset for Side View, 1940. Fig. 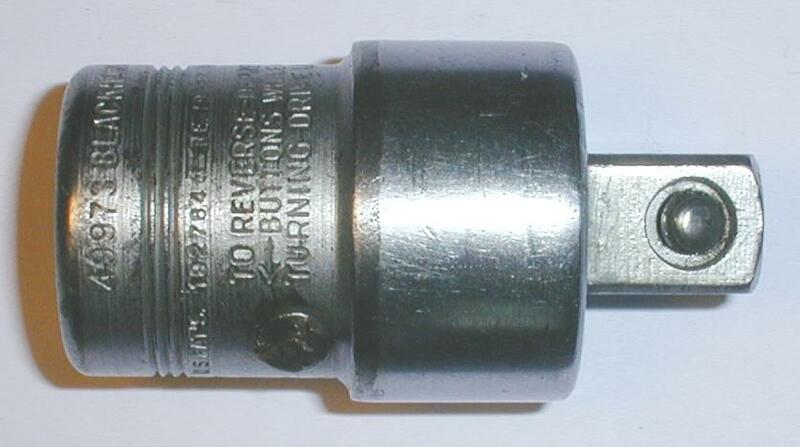 261 shows a Blackhawk 1/4-drive 24991 ratchet, marked "U.S.A." with a "-0" date code, and with a "U.S. Pat. 1,995,009" patent notice. The overall length is 4.5 inches, and the finish is chrome plating. The grooved handle is the "Gripline" style, used by Blackhawk from about 1938 until 1946. The Gripline handle together with the "-0" date code indicate production in 1940. The ratchet mechanism uses the design described by patent #1,995,009, the same patent used for Blackhawk's ratchet adapters such as the 39967 Ratchet Adapter. Blackhawk has done an exceptional job of miniaturizing the mechanism for this 1/4-drive tool, and the ratchet head measures just 0.78 inches in diameter. Fig. 262. Blackhawk 24991 1/4-Drive Ratchet, with Inset for Side View, 1943. Fig. 262 shows a somewhat later Blackhawk 24991 ratchet, marked "U.S.A." with a "-3" date code on the Gripline-style handle. A patent notice "U.S. Pat. 1,995,009" appears on the reverse (not shown). Fig. 263. Blackhawk ND10 1/4-Drive Socket Set, 1948. Fig. 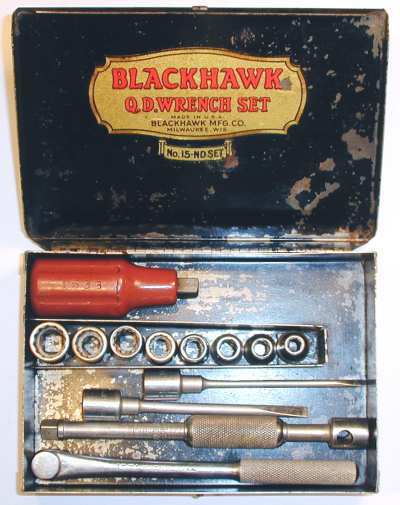 263 shows a Blackhawk 1/4-drive ND10 socket set in a molded Bakelite case, consisting of eight 210xx-series sockets, a 24999 flex-head handle, and a 24997 cross-bar. The socket models and sizes are, from the left, 21014 (7/16), 21012 (3/8), 21011 (11/32), 21010 (5/16), 21009 (9/32), 21008 (1/4), 21007 (7/32), and 21006 (3/16). Each socket is stamped "Blackhawk" and "U.S.A.", and the finish is chrome plating with polished upper walls. The flex handle has circular grooves on the handle, a design used in production in 1947 and later. The flex handle and cross-bar are both marked with "8" date codes, which together with the handle style indicate production in 1948. Fig. 264. Blackhawk 34981 3/8-Drive Gearless Ratchet, with Insets for Side View and Marking Detail, 1943. Fig. 264 shows a 3/8-drive Blackhawk 34981 "Free Wheeling" gearless ratchet, marked "Made in U.S.A." with a "U.S. Pats. 2003155 RE19287 1927844" patent notice. The side view in the top inset includes the admonition "Keep Well Oiled" and a "-3" date code, interpreted below as indicating 1943. The Gripline handle with a date code of "-3" indicates a manufacturing year of 1943, which is consistent with the cadmium plated finish. Fig. 265. Blackhawk 34985 3/8-Drive Cross-Bar, ca. 1930s. Fig. 265 shows a Blackhawk 34985 cross-bar for use with 3/8-drive tools, stamped "Made in U.S.A." on the shank. The overall length is 8.1 inches, and the diameter is 0.37 inches (3/8 nominal). The finish is chrome plating, with some loss due to wear. The bar is fitted with a stop-ball at one end, and is intended for use with tools such as the 34986 Flex-Head Handle or 9210S Extension. Fig. 266. Blackhawk 34986 3/8-Drive 8 Inch Flex-Head Handle, 1944. Fig. 266 shows a 3/8-drive Blackhawk 34986 8 inch flex-head handle, marked "Made in U.S.A." with a "4" date code, and with a "U.S. Pats. RE19,287 1,927,844" patent notice. This tool has a "Gripline" style handle with raised ribs along the axis, and the handle is equipped with a cross-bar hole for use with the 34985 Cross-Bar shown in another figure. The Gripline handle style with the date code of "4" indicates a manufacturing year of 1944, which is consistent with the cadmium plated finish. Fig. 267. Blackhawk 30220 3/8-Drive 5/8 Universal Socket, with Insets for Broaching and Marking Detail, 1943. Fig. 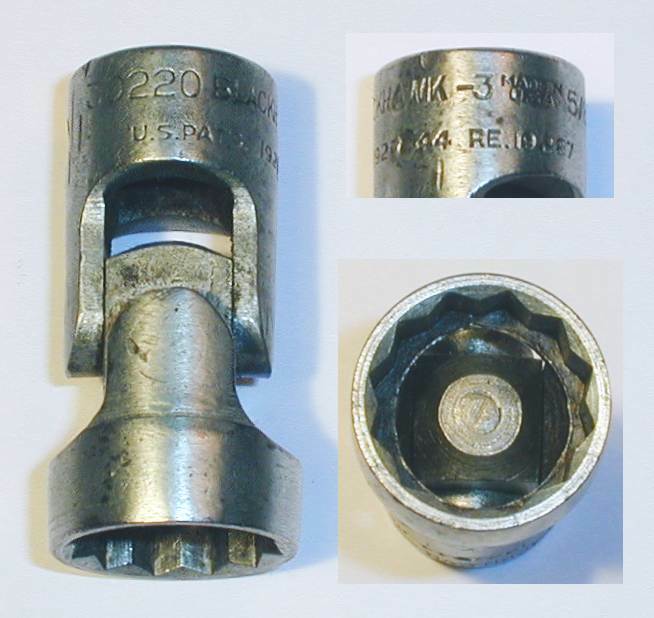 267 shows a 3/8-drive Blackhawk 30220 5/8 universal socket, marked "Made in U.S.A." with a "-3" date code, and with a "U.S. Pat's. 1927844 RE.19,287" patent notice. The cadmium finish and "-3" date code indicate production in 1943. Fig. 268. Blackhawk 34982 3/8-Drive 16 Inch Speeder, with Insets for Construction and Marking Detail, 1947. Fig. 268 shows a Blackhawk 3/8-drive 34982 16 inch speeder, marked "Made in U.S.A." with a "7" date code. The overall length is 16.4 inches, and the finish is chrome plating. Note that this tool is fitted with a conventional friction ball. Fig. 269. Blackhawk 34998 3/8-Drive Ratchet, with Inset for Detail, 1951. Fig. 269 shows a Blackhawk 3/8-drive 34998 "Bald-Head" ratchet, marked "Made in U.S.A." with "U.S. Pat's. 1,995,009". The ratchet handle has the circular grooves used for most drive sizes (except 7/16-drive) in 1947 and later. The date code is marked "-1", which together with the handle style indicates production in 1951. This tool was helpful in understanding the date codes after 1947. The reader may recall patent #1,995,009 from the discussion of the Model 49973 Ratchet Adapter. The mechanism here is the same, and the push-button works by holding the shifter plate while the drive stud is rotated to the opposite setting.